These have become a go-to staple in our household. I make a big batch of these amazing little balls on a regular basis. (They freeze wonderfully.) They are so handy for a quick breakfast-on-the-go option, after-school snacks and to toss into lunchboxes. 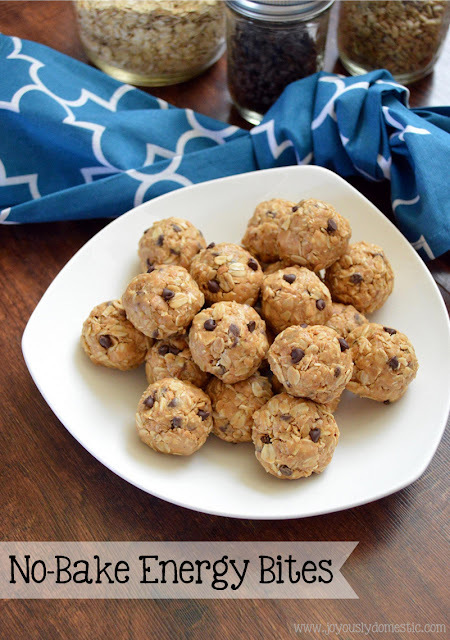 They are wholesome, healthful and a huge hit with our entire family ... one of my kids' favorite homemade treats. 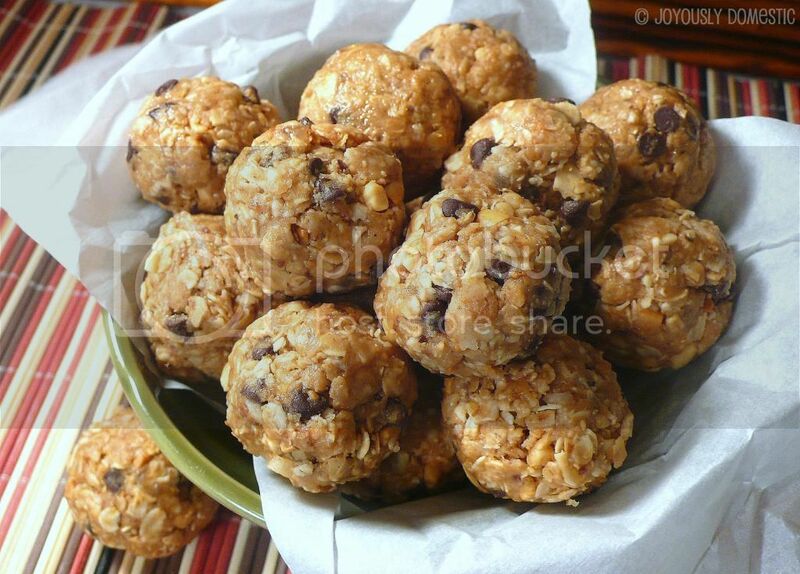 The flavor and texture of these remind me of a cross between no-bake cookies and chewy peanut butter power bars. It takes only a matter of minutes to mix up the ingredients. Then, after thirty minutes of chilling the "dough" in the fridge, you roll the mixture into balls and you're done! Keep a batch of these in the fridge/freezer and you'll have a quick energy-booster to grab on the fly. I double or triple the recipe most of the time because they are so well-loved in the JD house. I think you'll love them, too, and I'd adore hearing from you once you try them. Yields 2 - 2 1/2 dozen "bites" (balls). Using your hands, shape into balls (about the size of traditional meatballs ... around 1"). You will really want to squeeze and mold these tightly to get them into a ball shape. If your mixture seems too dry to shape, squeeze in a little more honey or add in a little more creamy peanut butter. Store in an airtight container in the fridge for up to one week or in the freezer for up to a month. 02/04/16: Updated post body and photos. I am sorry to hear about your grandfather. May peace be with you in this time. On a positive note, these look so yummy and I cannot wait to try them. They are right up my alley, I think. Thanks for sharing. Thank you so very much for your kind words, Bobbie. It is greatly appreciated. Hope you enjoy the recipe if you give it a try! Blessings! these are delicious! i just made them. i currently haven no working oven, so this was the perfect thing for a quick healthy snack! thanks for the recipe. I just made these!! And they are wonderful! Sooo good! My friend Stephanie told me about this website! Sooo happy she did! Love all the recipes! Hi, Lillian. (Love the name - it's my daughter's middle name!) Thanks for stopping by! I'm so glad you posted ... it was just in the nick of time, too. I had just began the prep for putting a pork roast in the slow cooker and couldn't decide what seasonings/sauce I wanted to use. I ended up just using S & P. Just after I put it in the slow cooker, I saw your comment, checked out your blog and my pork roast is now a Slow Cooker Parmesan Honey Roast ... thanks to the recipe that I saw on your blog. Isn't it lovely how life works! So, a THANK YOU is in order to you, too! :) Love your blog, btw! Finally! I have been looking for something like a granola bar that I can give my (peanut free) kiddos at that witching hour when it's too early for a meal but too late for a snack!! It's so hard to find something easy and yummy for a 2 and 1 year old!! Sun butter is a fantastic PB substitute and will be fabulous in this! THANKS!! Hoping these work for you! I make 2 or 3 batches a week now of different variations of these! My kids all love them ... and so does my hubby and I! There are so many add-in options, so they never get boring! Thank you for stopping by and for leaving a comment! :) And, thanks for the sunflower butter suggestion ... I'm sure many people will love that idea! These look and sound great! Have you made them into bars, might be easier for me to pack in hubby's lunch that way. I was also thinking of adding dried cranberries for a tartness and maybe substituting with almond butter. Thanks for sharing. Hi there. Yes, I have made them into bars and also have pressed them into mini muffin tins - they end up looking like little hockey pucks. :) Any way I've made these, they are a huge family hit. I make a batch or two each week! And, I have done another post on these that are done with cranberry and dried dates ... we love those, too! I've used almond butter and peanut butter and have added in just about every kind of nut. Sunflower seeds are great in these, too. The possibilities are endless. Sorry for your loss :( Always hard. I just made these but substituted the peanut butter with ground roasted almonds into a kind of almond butter and they are divine...I had to stop myself from munching on the batter! Wonderful recipe!